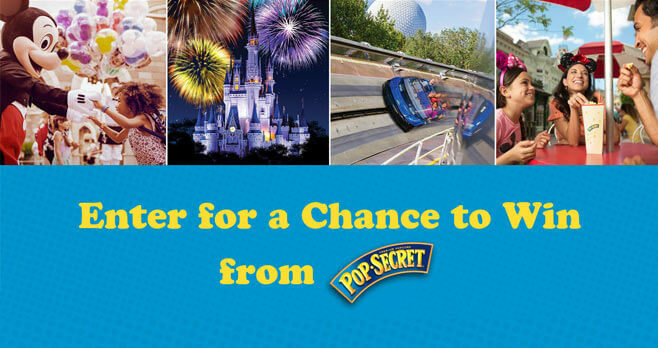 Pop Secret, official popcorn of Walt Disney World and Disneyland Resorts, is sponsoring the Pop Secret Disney Sweepstakes, a new Disney Sweepstakes where fans who enter at PopSecret.com/Disney by April 1st have a chance to enjoy the endless magic of Disney. Are you ready to pop your way into Disney Magic? Over $25,000 in prizes! From now through April 1, 2017, look for promo codes inside of the game pieces located on the outside of the packages of specially-marked boxes of Pop Secret popcorn products. To enter for a chance to win, reveal your Code then visit PopSecret.com/Disney to enter it and find out if you’re an instant winner of a digital movie code to stream Beauty and the Beast or Princess and the Frog. Plus, you will be automatically entered into the Sweepstakes for a chance to win the grand prize of a family trip to Walt Disney World Resort. Eligibility: The Pop Secret Disney Sweepstakes is open only to eligible legal residents of the 50 United States or the District of Columbia who are 18 years of age or older, or, if higher, the age of majority in their state of residence as of the time of participation. Sweepstakes Period: Begins at 12:00:00 p.m. (noon) CST on February 19, 2017 and ends at 11:59:59 p.m. CDT on April 1, 2017. Limit: Online entry of Codes is limited to one Code per day, per person during the Promotion Period. Random Drawing: On or about April 4, 2017, one potential Sweepstakes Prize winner will be selected in a random drawing from all eligible Sweepstakes entries received during the Promotion Period. One coupon for each guest to receive a bag of popcorn a day for five (5) days at designated locations within the Walt Disney World Resort Theme Parks Only. Winner’s List: For the name of the Sweepstakes Prize Winner, mail a self-addressed, stamped envelope to: Pop Secret Instant-Win Game and Sweepstakes Winners List, 10 South 5th Street-7th Floor, Dept. 1186-700, Minneapolis, MN 55402, for receipt by June 2, 2017. Sponsor: S-L Snacks National, LLC, 13515 Ballantyne Corporate Place, Charlotte, NC 28277. Administrator: Young America, LLC, 10 South 5th Street-7th Floor, Minneapolis, MN 55402.
i have a code how do I enter it to see if I win?po96xrmg6y print is so small i can’t read.